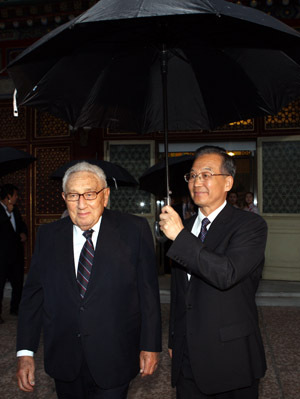 China Defense Blog: CDF Book Review: Henry Kissinger: On China. For serious students of international relations such as Stephen Colbert(here), and Charlie Rose (here), it is difficult to escape the recent conversations surrounding Kissinger's latest book, On China. The book could not come at a better time; in the backdrop of a media environment largely dominated by alarmist premonitions about China's rise, knee-jerk condemnations of all influences Chinese, gleeful predictions of its "inevitable" political demise, or another sputnik moment yearned by politicians and NYT pundits alike, it is increasingly difficult for the average Chinese spectator to see American discourse on China as anything but excessive alarm or perpetual contempt. This makes Henry Kissinger's "On China" a must read for not only American students of international relations but more importantly Chinese scholars of the US, for it reveals a side of America not often seen - one that is genuinely sympathetic to different worldviews, not driven by missionary exceptionalism or fearful of being left behind by the Chinese high speed rail, but deep seeded understanding based on half a century of direct engagement and a sincere desire for cooperation and co-existence. Its ironic that Kissinger is not exactly known for his idealism. Against whom and what? The multiple-character statements were silent on that issue, probably because Deng could assume that his audience would understand instinctively that their country’s position had grown precarious, both domestically and even more so internationally." Like other Americans such as Sydney Rittenberg and Robert Lawrence Kuhn, Henry Kissinger served diligently as a bridge-builder for two societies whose ideologies are utterly alien to each other. His book can serve as a reminder to the Chinese of the need to look past the zealously hostile rhetoric, find sympathetic partners, and foster a genuine sense of strategic trust. It would serve America well to give Chinese scholars and policymakers a glimpse into the other side of the American perspective - one that does not resign to the inevitability of conflict & confrontation. When published in China, this book will be a much needed respite from the incessant noise of hostile media sound-bites. Yes, I am the new Chinese primer.